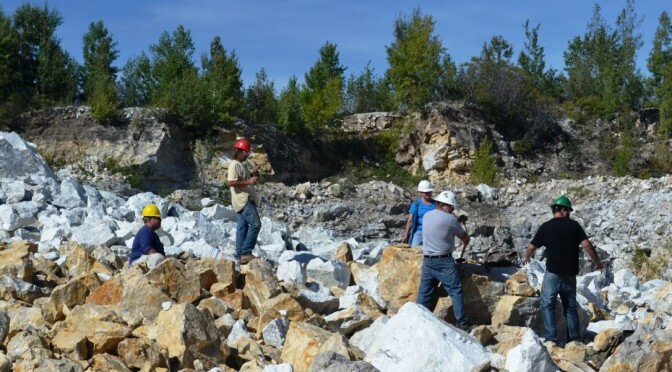 The quarry is owned by Gardenscape Inc. of Gouverneur and the location has been providing products to professional landscapers and others since 1976. Much of the quarry marble is crushed into powder, bagged, and sold as lime for agricultural use or for lining athletic fields. It is sold both under the company name of Gardenscape or under the brand Quikrete at Lowe’s and other retailers. Gardenscape also crushes the brilliantly white marble to several sizes and bags or sells as larger blocks for landscape use. Most of the processing is done onsite. Our interest in the site was twofold. First, in some regions of the quarry dolomitizing fluids had entered the Precambrian marble. While converting the marble to a tannish or off white dolostone, this process also generated vugs in the host marble. And we all know that vugs are very good. In this location, white dog-tooth calcites up to one inch and often clustered are found lining the vugs. Often they contained aesthetic dark phantoms. Although not always easy to extract, a combination of persistence and proper use of chisels allowed all present to go home with calcites from a new location to add to their New York collections. Cabinet size (4″ across) vug filled with milky calcite. 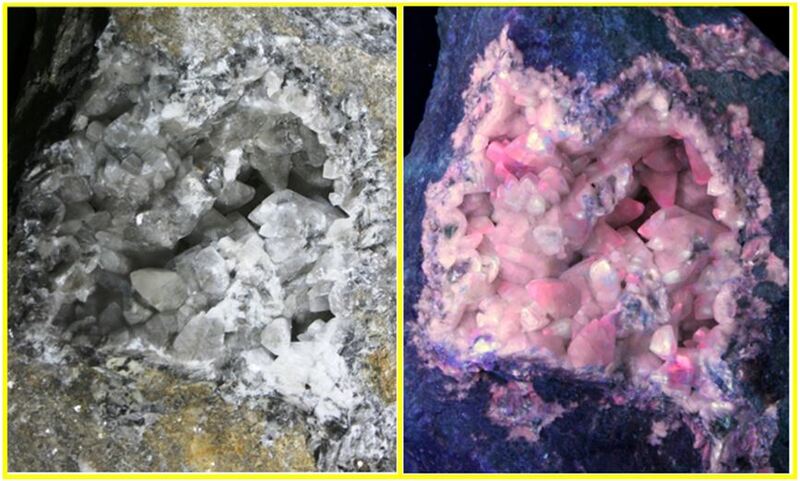 The site is also known for fluorescent norbergite. 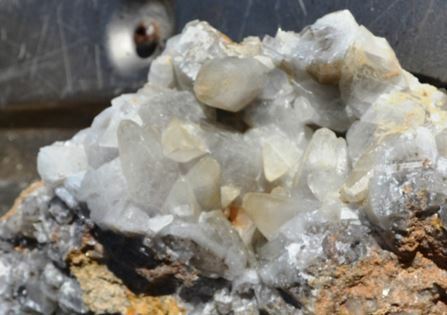 Norbergite is a magnesium silicate from the humite group (formula – Mg3(SiO4)(F,OH)2). The orthorhombic mineral is often found in high-grade marble deposits as an accessory mineral. Despite having several black lights and dark tarps this tan, fairly non-descript mineral was elusive and only a few possible grains were found. We did find small green diopside and as the lower right picture notes, there was pyrite scattered throughout the marble in the quarry. A boulder with a large streak of pyrite was spotted on the quarry floor. Naturally Ken St. John (in yellow with the saw) was not about to leave that behind. Bill Chapman and Craig Stephens are busy with their big hammers at a safe distance from Ken.